If you're a member of The Fizz you know all about the Fizzy Party Bakery and baked along with us this weekend. If you're not a member, well, I just can't understand why not. 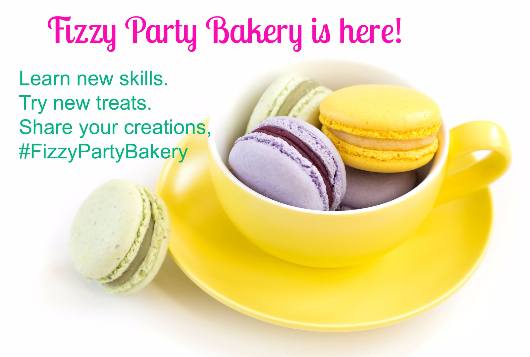 You're totally missing out on upcoming party information, upcoming products, coupons, and the best part, the bakery! All signed up? Good. Let's get to the good stuff then. This weekend was all about baking up Chocolate Hazelnut Cupcakes using Bird On A Cake's recipe. I chose this recipe because hazelnuts are so Oregon. I needed a cupcake that said Oregon for my mom's retirement party. You see, my parents will be snowbirding to sunny Arizona soon. Just a few of the ingredients needed for the recipe. When I made the batter it was really runny and I was a little concerned the cupcakes wouldn't turn out. i had a backup boxed cake mix at the ready just in case. Once the batter was baked though, the cake turned out spongy and moist. Dressed and ready to party. Everyone at the party who sampled one said they were really good. The cake was moist and there was a nice hazelnut flavor to the cupcake. Don't forget to use #FizzyPartyBakery when you post your pics. I'm checking and will share your pic so be sure to hashtag!